This is my first try at a dishcloth. Yarn: 2 oz ball Peaches & Creme Worsted Weight 4 ply cotton yarn. 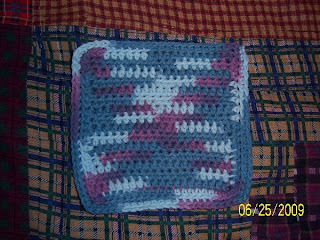 Round 1:ch 2, hdc in same stitch (corner), hdc 18 evenly spaced stitches across the ends of the rows to the next corner, 3 hdc in the corner, hdc in each ch across to corner, 3 hdc in corner, hdc 18 evenly spaced stitches across to the ends of the rows, 3 hdc at corner, ss in top of first hdc. Round 2: ch 1, sc in back loop of 1st hdc, sc in in back loops only of each hdc around, 3 sc in center hdc in each corner. Fasten off and weave in ends.